When young, the Chalakudy River is lovely, nymphlike. And it brims with fish. Fishing doesn’t bother me as such, but I’m troubled by the legality of fishing inside a protected wildlife reserve. Every once in a way you can see how forest department staff bend the rules ever so slightly to their advantage. What’s with a few tiny fish anyway, eh? The streams are just rippling with them.I’ve waded in murky ditches to catch guppies, chased shrimp in paddyfields and baited crabs with my fingers. Despite being an intrepid piscivore (hailing as I do from Kerala) I’ve never fished for sport, or for the pot. 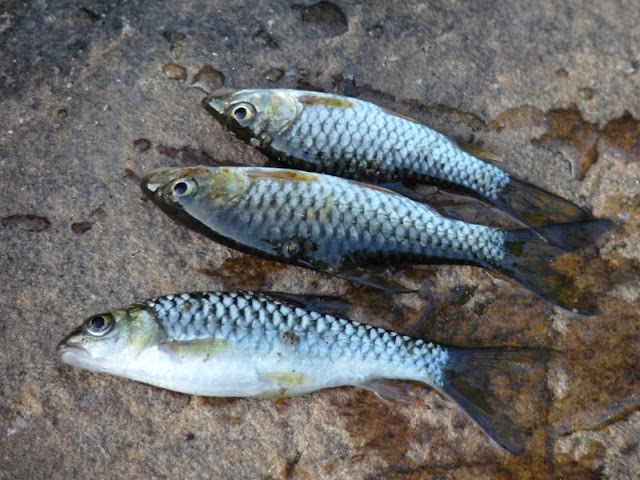 I have ideological reasons for that, though they have never stopped me from watching anglers pursuing golden mahseer with a tiny nudge of voyeuristic longing in my chest, or from enjoying Norman McLean’s A River Runs Through It. 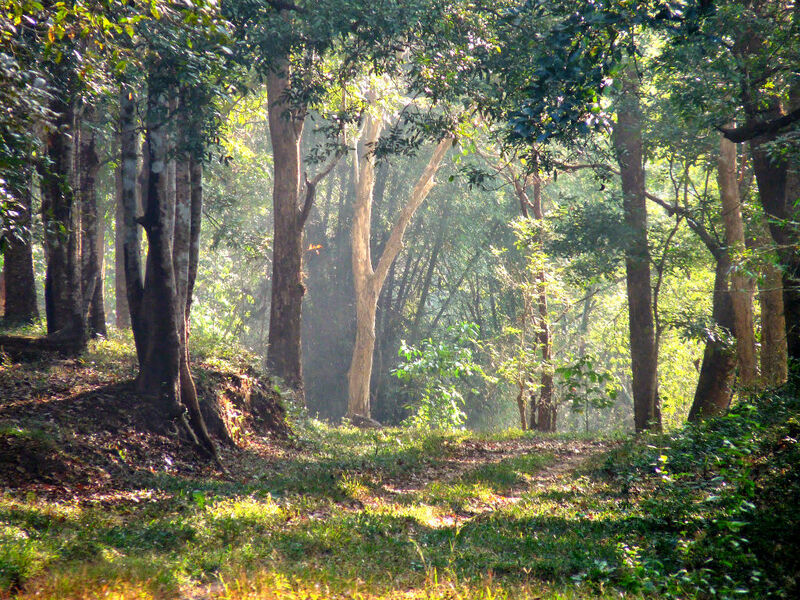 On our trip to Parambikulam in January we walked the 18 km length of the erstwhile Cochin Forest Tramway — now a broad path, littered with rusty bridges, cutting right through the heart of the beautiful sanctuary. At the end of the trail is a guest house where we were put up for the night. It had no amenities apart from a room with three narrow cots to accommodate four tired bodies. 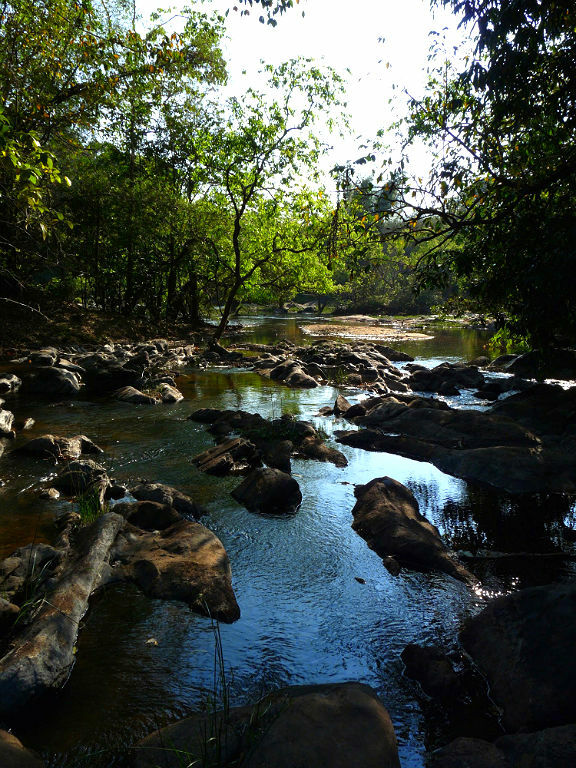 But the gurgling Chalakudy river was our pleasure palace — we lounged in it and let the stress of the day’s long, hot walk dissipate into the all-consuming water. There were Nilgiri Langurs in the trees, and dragonflies, butterflies and damselflies to occupy our attention on the ground. Underwater, fish tickled our feet, evoking nervous schoolgirl-like giggles from four grown men. 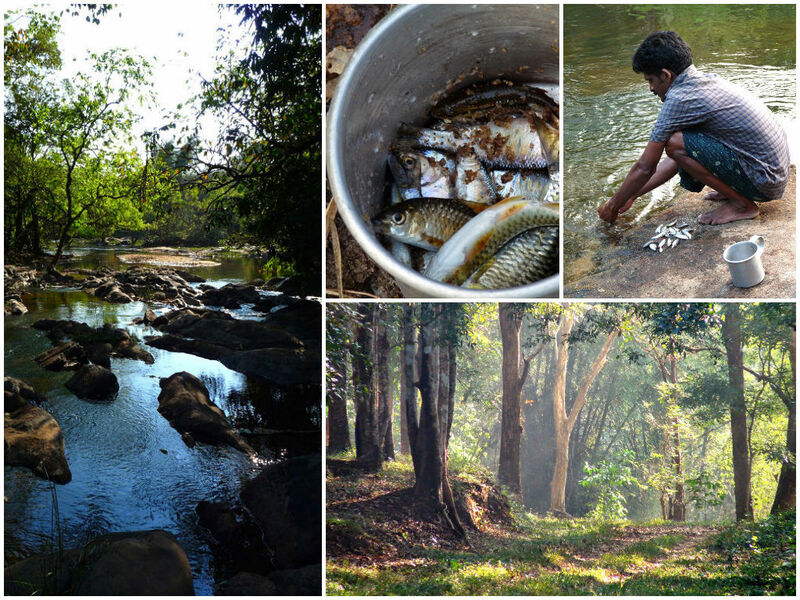 Presently Manoharan, one of the three forest guards who had accompanied us, came down to the river and remarked at how it was brimming with fish. They were the young of a large river fish, he said, which was very palatable. Clearly, that was no academic observation. We watched with surprised interest as he got down to work. He had no line, no hook, no fly or net. He took a shallow pan and fastened its mouth with a thin cotton towel that Mallus call thorthu. 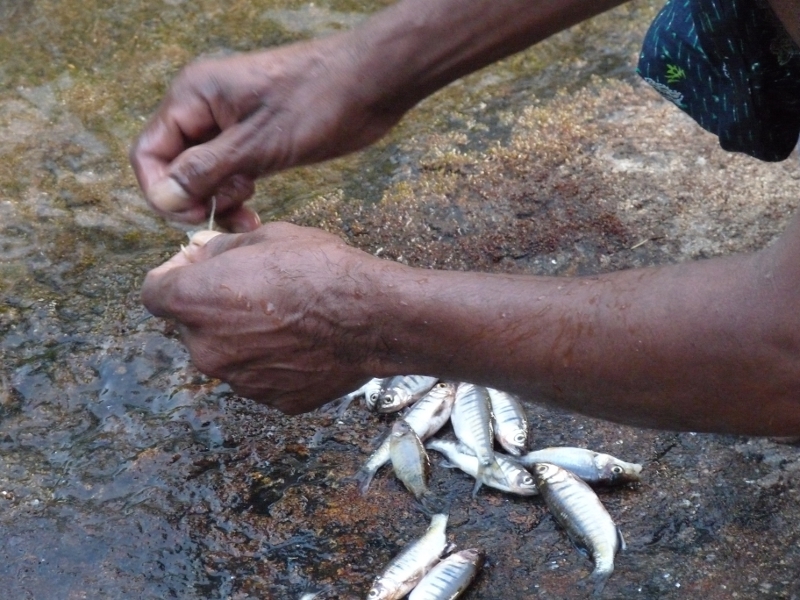 He gouged a really small hole in the taut cloth and placed a ball of cooked rice at the bottom of the pan, which he then placed in the river where the fish were swarming. 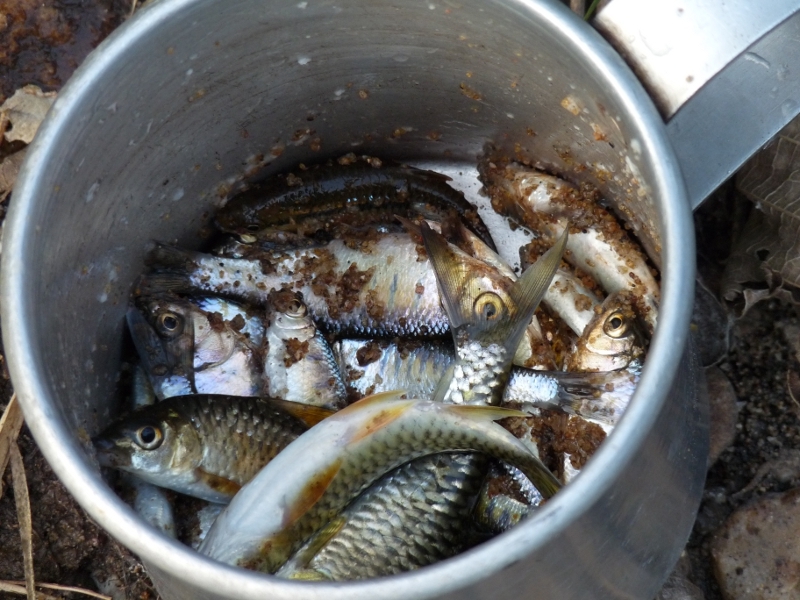 We sat back and watched as the pan filled up with fish attracted to the bait. They stampeded in through the hole but were unable to escape once in. When the pan was sufficiently crowded with fish, Manoharan scooped it quickly out of the river. He must have caught at least a dozen small fish. 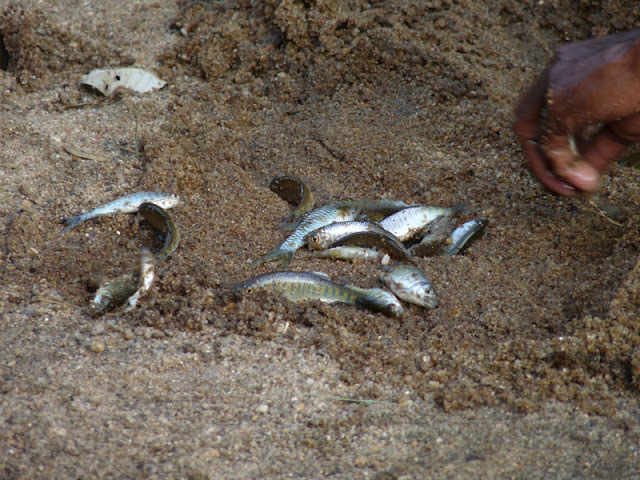 His companion scooped a hole in the sandy bank and emptied the pan. 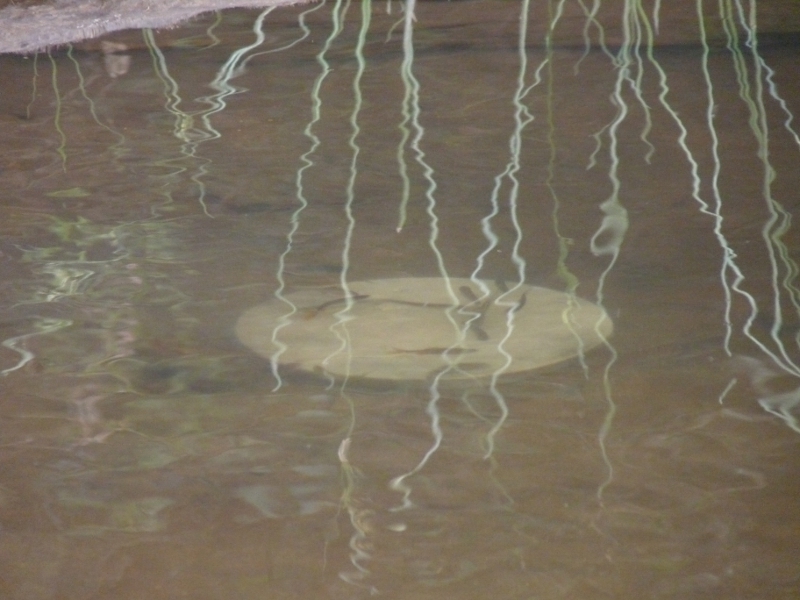 Struggling, the fish gasped in the shallow puddle until life ran out. 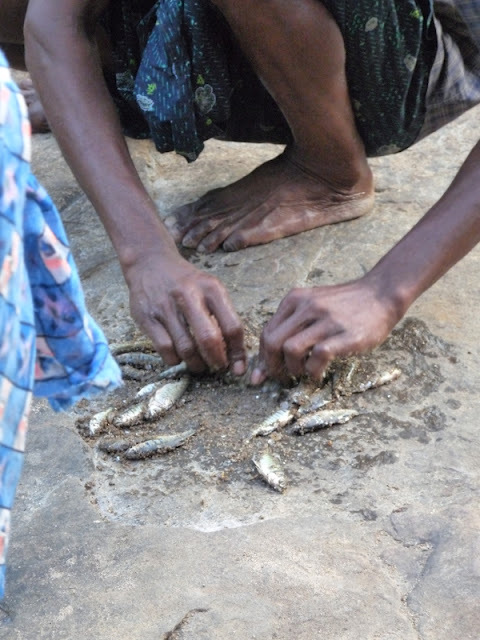 Meanwhile, our man expertly gilled and gutted his catch, shaving off the scales by rubbing the fish with river sand against a slab of rock. He pinched the heads off and tossed them into the river for its cannibalistic kin to dine on. 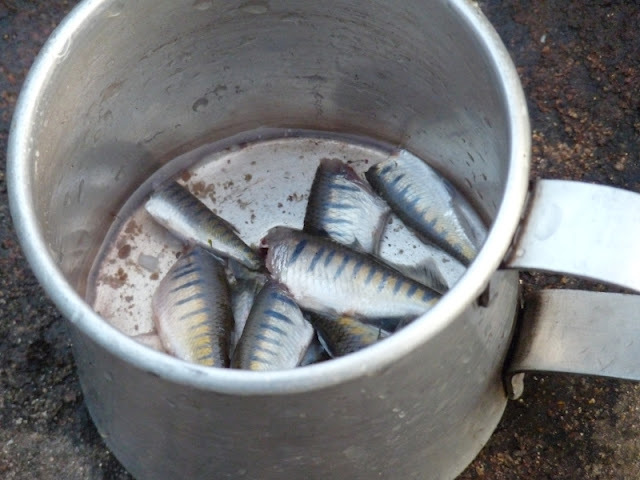 Dismembered, the fish looked hauntingly inert, both in the aluminium mug that held them, as well as in the river that had once rippled with life. If it was any consolation, we didn’t get to eat any.